If you are experiencing tooth pain or have not seen a dentist on over six months, contact our office to schedule an appointment. What Restorative Options Replace Missing Teeth? If you have missing teeth or need a tooth extracted, it’s time to look at your tooth replacement options. The price for restoration dentistry will vary. 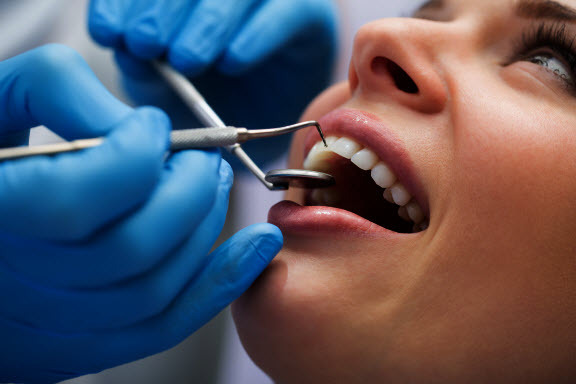 The cost of your treatment will vary upon the condition of your gums and if there are any other dental problems. Our treatment will not only help restore your smile, but it can also help prevent future issues and give you a smile you can feel good about. We will review your insurance benefits and out-of-pocket costs and manage all treatment to ensure you spend as little time as possible in the chair. Dental implants are a great way to replace missing teeth with fixed solutions. Dental implants have a 95%-98% success rate. Implants create a permanent anchor for your restoration, from a single crown to partial or full dentures, to keep it in place and stimulate your jaw bone for long-term oral health benefits. When receiving dental implants, it's essential to know that you will have to have multiple visits. Typically, the procedure requires at least four appointments with the first appointment being a consultation to see if you qualify for implants. At the first visit, we examine the health of your gums and all the surrounding teeth to see if extraction treatment is needed before the implants are applied. Next, we will need to check the quality of your jaw bone. Your jaw bone must be able to secure the implants. This exam will determine if you will need a bone graft prior to the implant being set to improve the jaw bone. Once the jaw bone is proven to have a healthy foundation, you will be scheduled for your implant procedure. Treatment time and office visits vary depending on your specific needs. Denture (full or partial) – When an implant permanently anchors the denture in place, you will not need to worry about adhesives or movement while eating or speaking. Overdenture – This is a removable denture that snaps in place atop dental implants or any remaining healthy teeth. Bridges – When an implant supports a bridge, neighboring teeth are not compromised. Crowns – If you have a single missing tooth, we use a crown, secured in place by the implant, to fill the gap. When considering dental implants to replace missing teeth, it is important to look at everything you get from the high-quality, long-lasting, permanent tooth. It has been shown that dental implants keep neighboring teeth from shifting into the gap and preserve the jawbone, reducing the risk of more teeth being lost. 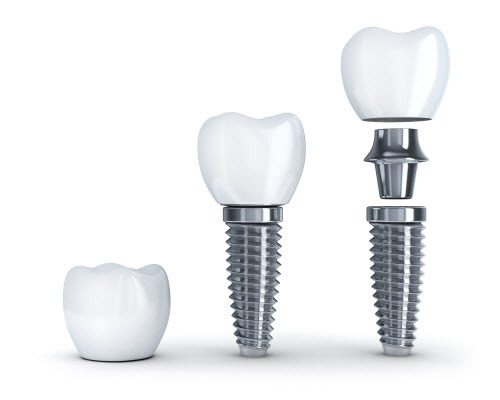 Dental implants help protect the structure of your face. The implant puts force on your jaw as you chew just like a natural tooth, to keep your bone strong. This decreases the chances of your face structure looking sunken in, which is commonly found in patients with missing teeth. Implant-supported restorations will give you the freedom to smile, speak, and eat in public without worry or embarrassment of movement. Investing in your smile will give you lifelong benefits and minimize the number of restorations that may be needed in the future, potentially saving you money. Partial and complete dentures are the popular options for replacing missing teeth. Contact us about your out-of-pocket costs and benefit coverage for final restoration and other costs of treatment such as treatment for gum disease or extraction when considering dentures. If you are missing several teeth or are having multiple tooth extractions, then you qualify for dentures. If you have advanced gum disease, then eventually you will need dentures after treatment. Whether you want implant-supportive dentures or removable ones, our dentists at Ultimate Aesthetics will help you understand your options. What Is the Time Frame for Getting Dentures? Traditional dentures average 2-3 dental appointments and may include more with extraction or gum disease treatment. To create the final denture plate, we take impressions for the laboratory and schedule your next appointment about two weeks later. We will make any necessary adjustments on your next visit and will teach you how to clean and wear your new dentures effectively. We highly encourage you to schedule follow-up prevention appointments, so that we can adjust the denture or get a replacement if needed. If you have a few missing neighboring teeth, the gap can be filled by a bridge. The traditional fixed bridge is a popular option for anchoring replacement teeth using adjacent healthy teeth. Fixed bridges for missing teeth are a permanent solution. Two crowns are attached to the adjacent teeth, and an artificial tooth is inserted in the middle to anchor the bridges. A fixed bridge prevents the remaining teeth from shifting and can be made from colored tooth materials to achieve your cosmetic goals. Fixed bridges are a non-invasive approach that resembles your natural smile. Similarly, to crowns, fixed bridges require more than one appointment. What bridge options are covered by my insurance? Do I qualify for an implant supported bridge? Are my surrounding teeth healthy enough to support a traditional bridge? When Are Crowns, Inlays, and Onlays Used? When deep cavities cannot be filled with standard fillings, and there is enough healthy tooth left to save, our team will use inlay’s or onlays to preserve the nature tooth. If the tooth is too damaged, a crown will be used to protect what remains. The Inlay fits snuggly inside the tooth cusp. The Onlay fits the tooth on one or many cusps. The Crown cover the tooth on every side. What is the Process for Crowns, Inlays, and Onlays? After the damaged parts of the tooth are removed, we will make a dental impression and sent to the lab where a prosthetic tooth is created that is identical to the damaged tooth. We will place a temporary replacement until your next appointment to insert the custom prosthetic tooth. Your restored tooth will look and feel natural as long as you care for it properly. 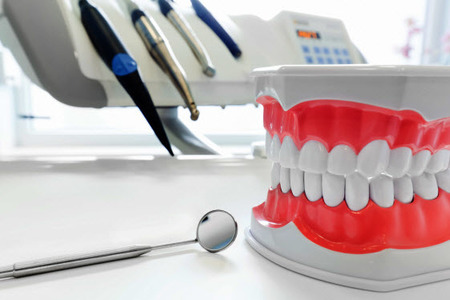 Your restorations are designed to last, and you'll enjoy a healthy bite for a long time with proper care. Continue to visit Ultimate Aesthetics for routine exams every six months so that we can examine the health of your gums, natural teeth, and check for signs of wear and tear in your restorations. Early intervention, like any dental issue, will save you time and money.